Posted on May 19, 2012 by David H.
If you step into a cultivated landscape, like a cemetery for instance, and take a look around and see some trees, a general assumption, or a common one at least, is that those trees are there intentionally, that is, that it was decided by someone, or someones, to place them where they are. For a tree to last from year to year it takes some amount of care, or at the very least it takes not cutting it down or pulling it up – and so if a tree is growing in a place that is landscaped, and the effort is being put into maintaining it, or at least it isn’t being removed, it would seem likely that it would have been placed there with some kind of thought – after all, who would take care of a tree if it hadn’t been meant to be there? If they hadn’t meant for it to be there, wouldn’t they have gotten rid of it? It just seems like common sense to assume that, in a cultivated landscape, if a tree is there, that it was put there by a person, that it was placed there by someone, that it was planted with intention. This assumption, however, is wrong. Last year, in July, I was out at Mt. Moriah Cemetery, in southwest Philadelphia. Mt. Moriah was established in the 1850s and was designed as a “rural cemetery”, with an ornate entrance and winding roads going through it, like Laurel Hill in North Philadelphia, or Mt. Auburn in Cambridge, Massachusetts. However, distinct from those rural cemeteries, Mt. Moriah was (and is) populated primarily with the middle class and the working class – in contrast to the more wealthy citizens of those other cities of the dead. Mt. Moriah was originally entirely in Philadelphia, but it later expanded out of the city, reaching across Cobbs Creek and over into the Borough of Yeadon. Now, it’s a few hundred acres of rolling hills, and gravestones, and monuments, with trees here and there dotting the landscape. And in some places those dots come very close together. This cemetery, for a number of reasons, has become somewhat overgrown, and in many places the plants have taken over and risen up and over the gravestones, crowding in on them, and filling over the space with green. On the Philadelphia side however, when I was there last year, the grass had been mown, tangles had been taken out, and it was pretty well open, cut and cared for. And so as we arrived, walking along Springfield Ave, I saw grass, and open space, and also trees here and there among the headstones. I was interested to see what those trees were, that were planted there – since this cemetery has a different demographic than that of Laurel Hill or Mt. Auburn, I wondered what trees they would have used – would they have been similar, or perhaps even the same, kinds as those in the cemeteries with wealthier interments? By seeing what persists in the environment, we can see what was done in the past, and so I was interested to see what the landscaping habits of the middle class had been, at Mt. Moriah. What trees were there, what trees had been there? As I got closer, I saw that those trees were mulberries, and black cherries, and they were, estimating by their size, probably about ten or twenty years old, or less. And I realized that, because people hadn’t been planting mulberries or black cherries at those times when these trees began their lives, and because these are trees that seed in on their own quite readily, for these reasons I realized that these trees that were set among the landscape had most likely been set there without our help, without having been planted by the hand of man and woman. They were little bits of feral landscape – though the land had been tamed and cultivated around them, cut back and trimmed, managed with thought, the tiny parcels on which those trees sat had been taken over by these plants whose seeds had just come in on their own, with help maybe of the wind, or of animals other than humans, but quite certainly without us. They had arrived, and they had stayed, without regards to human needs or wants. And so, I began to wonder – how long has this kind of feral landscaping been going on? How long has it been a habit for landscapers to just kind of let a tree grow, to not cut it down, to allow it to live until it became a part, indistinguishable unless you look closely, from the sculpted environment around it? And where else had this kind of element been a part of the landscape “design”? At a more cultivated cemetery, where most of the plants had been planted, would we also find feral plots? At the Woodlands Cemetery, there’s a mulberry that can answer these questions, at least a little bit. The Woodlands, formerly the estate of William Hamilton, a wealthy Philadelphia gentleman and ardent plant collector of the late 18th and early 19th century, became a cemetery in 1840 – and it remains a cemetery to this day. 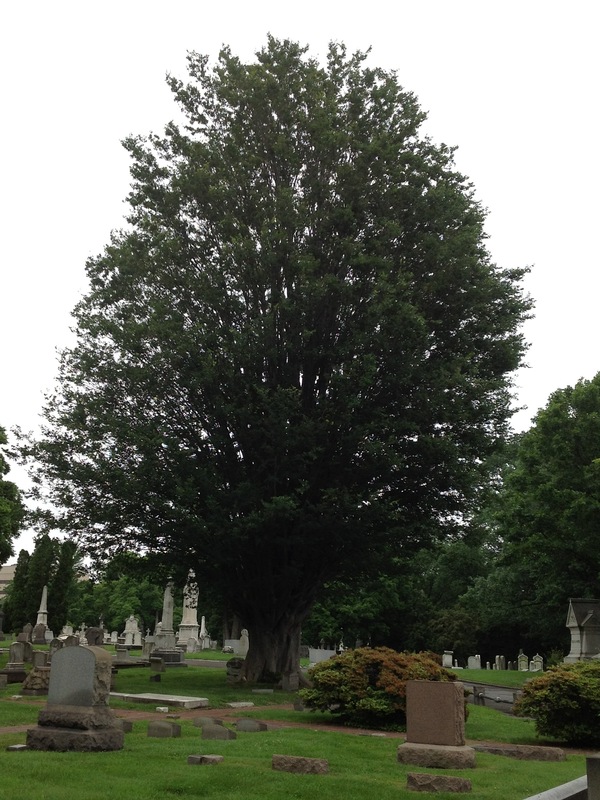 Rich with beautiful trees – red cedars, American hollies, and so much more, including the rarely seen Caucasian zelkova, the Woodlands provides a lasting record of how a cemetery was landscaped, at least for the tree part, over the last two centuries. And there is a mulberry tree there – back behind the house, towards the river, you can go there and see it towering up over the path towards the back fence there. It’s a very large tree, and from a cursory look it would appear to be part of the landscape just like the other trees there, just like the dogwoods and the pines and the English elms nearby. But, because it is a mulberry, it most likely was not planted there by a person, and it represents a feral part of the landscape, a tiny plot of land that went from tamed to untamed and now sits among blades of grass that are regularly cut, and among trees that arrived there via nurseries and seedhouse – among plants that are cultivated sits a wild tree. And so by looking at this mulberry, we can see that even the Woodlands, where most of the trees are planted, had some feral landscaping. But when did this happen? When did this mulberry start its life? And more broadly, more generally, how long have wild trees been allowed to participate in cultivated landscapes without being uprooted or cut down? And more specifically, how long has this wild tree, this mulberry, been occupying this feral patch of graveyard? By doing that, we find that the mulberry is well over 80 years old. We were able to count that many rings, and so get a good lower bound on the trees age. However, that’s just the rings we could count (some of them were indistinct), and since we only got 14 7/8″ through (i.e., not all the way), it’s most likely quite a bit older – the entire tree is about 53.2″ dbh (diameter at breast height), and so we can roughly approximate it to be over a hundred years old. This work, by the way, was done in collaboration with and due to the hardworking efforts of Ned Barnard, and Steve Minicola, and Joe Shapiro, and Jessica Baumert, and others who joined us on this day. I’d like to get another core out of there before saying for sure how old this mulberry is (and just to get a more precise date on it), but from this tree we can see that “feral landscaping” (that is, where plants that seeded in on their own, as I’m quite sure this mulberry did, are kept as part of a cultivated landscape) has been going on for at least a hundred years, at the Woodlands. Even in a cemetery, life persists. In human dominated landscapes, buildings are built and plants are planted, and so it’s easy to think that if a plant is in a park or a cemetery, or anywhere with wide open lawns and open spaces that are cut and cared for, and if that plant were to have grown to the size of a tree, well then it must have been planted there, While plants quite literally take on a life of their own, and there may be weeds among the cracks and in the lawns, it just seems like common sense to assume that, in a cultivated landscape, if a plant is there and it is not removed for such a long time that it grows to become a tree, then it must have been put there by a person, placed there by someone. However, as we look more closely and more broadly, we see that this is not always the case, that there are plants that have just kind of come in to these environments, and have been incorporated into cultivated landscapes and become pretty well indistinguishable from the trees that were planted there, and that it can be difficult to tell them apart unless you look closely, and that the wild, the cultivated, and the feral are not so different from one another. Posted on May 10, 2012 by David H.
There used to be a train station, in the lower northeast of Philadelphia, called Cedar Grove. It was on Tabor Ave, just a bit southwest of Godfrey Ave, and was on the Frankford spur of the train line that goes to Fox Chase, which is in a bit farther part of the northeast of Philadelphia. This spur went just about all the way to Frankford Ave, ending at a terminus between Unity and Sellers Streets. It was a train line that carried freight and also passengers – starting in the late 19th century, it lasted well into the 20th century, going behind the Sears on the Boulevard, along the eastern edge of Northwood Park, and among the houses of heavily populated Frankford. It also traveled through Cedar Grove. This was the name of the neighborhood, as well as the train station, and up through the early part of the 20th century, it had open marshes and thickets, and forests with spring wildflowers, and wild flocks of birds filling the sky. Cedar Grove is just to the east of Tacony Creek and just above the Boulevard, and in the early part of the 20th century it was quite unbuilt. There were woods there, with beeches and oaks, and poplars and sweetgum and ash trees and sassafras, too, all growing there among each other. In the spring there were anemones and partridge berries on the forest floor – and hayscented fern was there, as was the trout lily, one of the beautiful wildflowers of the spring, which would’ve come up year after year alongside the mayflower that was there, neighboring side by side with the bellwort (Uvularia sessilifolia) and jack in the pulpits. Another fern, royal fern, would’ve grown in low wet areas of the woods, and yet another fern, interrupted fern would’ve been a bit higher up. Royal fern, whose latin name is Osmunda regalis, is in the same genus as the interrupted fern, Osmunda claytoniana. The interrupted fern, however, likes it a little bit drier than its wetland cousin, and so would’ve been in areas a bit drier – upland and underneath the trees, growing along with and near the wood sedge that would’ve dotted the ground up there. Dwarf ginseng was also in the woods of Cedar Grove, on the ground, growing among the willow oaks, and poison ivy scrambled there, too. Pinxter, the azalea with its wild pink flowers, would’ve been a bright beacon in the forest of the early spring. Beneath the beeches and the oaks were also Dutchman’s pipes, a plant also commonly called by its Latin name, Monotropa. This is a parasitic plant, it doesn’t make its own sugar, it isn’t green, it doesn’t photosynthesize – it eats sugar that is carried through mycorrhizal fungi, this achlorophyllous plant parasitizing the fungus that in turn has gotten its sugar from a plant with which it is mutualistically symbiotic. In addition to these forests, there were wide open flats, somewhat wet, in Cedar Grove, with sheep laurel and blueberries, and purple milkwort (Polygala sanguinea), too. Swamp white oak and black willows made little canopies here and there in these wet areas, as woolgrass (Scirpus cyperinus) nodded in the breeze nearby, bobbing along with the rustling of the narrow leaved and the wide leaved cattails. Swamp milkweed (Asclepias incarnata) attracted the butterflies, and close to the ground, trailing lightly and low, was the cranberry (Vaccinium macrocarpon). And there were birds – enormous flocks of blackbirds flew above the flats. And in the woods Eastern Towhees (which also used to be called, colloquially, “chewinks”) scratched and picked among the leaves, loudly and boldly, with White-throated Sparrows following behind them, picking through their trails. American Kestrels (also known as sparrow hawks, back in the early 20th century) cruised above the long flat fields of Cedar Grove, and Ovenbirds walked among the forest trees, occasionally flying up to sit in a tree’s branch and sing. Meadowlarks, now rarely seen in Frankford, used to be in Cedar Grove year round – in the middle of December, in flocks numbering to more than 25, they’d get flushed by a train going by and fly through the air. And the Winter Wren was out along the train tracks, too, in the icy cold, a little chilled hobo out there in the sleet and snow. So how do we know all this? How can I say with such detail what was living and growing in Cedar Grove in the early 20th century, when I wasn’t there and wasn’t until many decades later? Well, one can reconstruct former ecologies, one can estimate historic plant and animal communities, by knowing habitats of plants and animals, and figuring out, based on climate and soil and hydrology what the habitat of the site would have been in the past, and then, building from that information, one can construct a vision as to what would have been there in the past. That’s one way to do it, and for most places in the world, that’s really the best you can do. And we can use those records, if we know about them, to learn about what was here before. Or, if we don’t know about them, we can talk to those that do. In 1910, Henry S. Borneman read a paper before the Historical Society of Frankford about the birds that were in the area, including Cedar Grove, in the late 19th and earliest 20th centuries. Over a hundred years later, in 2012, Susan Couvreur and Diane Sadler, of the Historical Society of Frankford today, drew my attention to that work, with its richly detailed description of the bird life of Frankford, and also its discussions of the plants and habitats of the time. There are also plants from Philadelphia that were, in many years past, collected, pressed, dried, and mounted on paper sheets, that are now deposited at the Department of Botany of the Academy of Natural Sciences of Philadelphia, and these plants that were collected decades ago provide evidence of what is no longer there. There’s also a list of historic collections of plants from Philadelphia, that was extracted from the Plants of Pennsylvania database maintained by the Morris Arboretum, that was kindly provided to me by Ann Rhoads and Tim Block (botanists at the Arboretum). This list provides an effective guide to the many collections from Cedar Grove that have been made in the past. There were collectors in years gone by that allowed me to develop this wonderfully rich description of a site that has changed so much. Walter Benner collecting sheep laurel (Kalmia angustifolia) on the 8th of July in 1926, in a moist thicket of Cedar Grove. Samson McDowell, Jr collecting blueberry (Vaccinium corymbosum) in the moist woods there, on the 19th of May 1926. These collections are now part of the Academy’s collections, and nearly 90 years later, their work allowed me to see first hand the plants that were there when they wandered through those open areas of Cedar Grove. There are also maps, such as the 1895 and 1910 Bromley Atlases, from the Athenaeum of Philadelphia (available on PhilaGeoHistory.org), that show just how open the area was, how unbuilt it was a hundred years ago, and where the train line that cut through Cedar Grove went. Taking these records, and applying some additional knowledge of ecology, we can describe Cedar Grove nearly as thoroughly as if we had walked through it ourselves – and a surprisingly detailed picture of this place in the early 20th century can be cobbled together. Its open marshy areas and its forests, both of them rich with flowers and birds, the train line running through it, trees dotting the flats. An evocative illustration can be drawn of a landscape that is no longer there. And perhaps an evocative illustration can also be drawn of a landscape that is yet to be.